The Centre for Sustainable Road Freight each year holds a workshop that brings together multi-disciplinary teams of researchers and industry leaders to shape the research agenda and improve road freight efficiency and reduce its environmental impact. The 2018 workshop focused on disruptive innovations in road freight transport systems. On day one, the focus was on technological, logistics, policy and economic aspects of the transition to electrified urban, national and international road freight transport systems. Digital revolution in freight transport systems were the main theme for day two of the workshop. 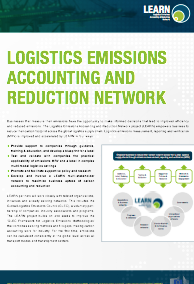 Sophie Punte of Smart Freight Centre presented on truck fleet management that includes monitoring of fuel and calculating emissions using the GLEC Framework that is alos being tested by road freight operators in the LEARN project. Check out Sophie's presentation here.